For me, this philosophy originated in my youth. We didn’t have cats or rabbits. We were dog people. Golden Retriever people to be precise. I learned to stand by pulling myself up on the hair of our dog Niki. She would stand patiently as I pulled out chunks of hair and tried to balance on wobbling legs. When I was about nine we got another retriever. We named him Buddy after Air Bud fame and he became my shadow. Sleeping on my bed, pulling me on my scooter, and catching the pancakes we balanced on his nose. As sad as it was when Niki finally passed away peacefully in her sleep at 13, Buddy was the first real loss in my life I was old enough to comprehend and feel. Being far away and unable to say goodbye made it even harder. Between my tears, grief, and frustration, the concept of owning pets felt so pointless. I was angry that my dog had been taken after less than ten years. Why pour all this love and emotional attachment into something that you’ll outlive by decades? Because when the garage door opened when I got home and there was no rusty red blur streaking from under the growing crack, I realized it was no longer a home. It was too empty, too quiet, too easy to walk across the backyard without the fear of tripping on tennis balls. Because Buddy had brought out the best I had. Unconditional love, acceptance, trust, a never-ending cauldron of joy. So with heavy hearts, we got another one. We never stopped missing Buddy, but we couldn’t stand a house without a dog. We got a puppy. A rescue from a shelter a few miles north. We named him Jake though I can’t recall how we chose his name. I write all this because Jake passed away last night in my mother’s arms after fighting gallantly against Lymphoma for five months. It’s not fair. It’s cruel. It’s a broken world. Jake was the unofficial third son. My brother and I nicknamed him Buster after the Arrested Development character. And in some ways he was Buster. He was a mama’s boy with two older brothers, and would go into fits of sorrow whenever Mom left the room. But you couldn’t deny his heart, his enthusiasm, and the patience that made him a wonderful service dog at Providence hospital. It was at the hospital that he shined brightest, touching the lives of countless sick and hurting people. He was everything you wanted your dog to be. And after seven years that went far too fast, there’s that painful emptiness in the Cannamore house again. Why? We know we have to say goodbye before they do. There will be a last time I hold Penny in my arms, a final scratch behind Porter’s ears. There will be pain, there will be tears, there will be a hole in our life. But it’s better to recognize the hole than to walk around for the rest of my life pretending its not there. The last thing Mom is thinking about today is another dog. It’s time to remember Jake. His bark, his irrational fear of heating grates, and those long gangly limbs that took up Dad’s side of the bed. But when the time comes to make the house a home again, there will be four more furry legs with floppy ears and golden fur. Armed with tennis balls and love. Rest soundly little brother. I’ll miss you. Paul announced the news in his usual, casual way, “a few people may be visiting the lab in early March from Greenpeace.” Made sense, we knew Greenpeace was holding a ceremony in nearby Alert Bay, and given Paul’s and Walrus’ ties to the organization, we figured a couple would want to stop in. Truth be told, the thought of playing host and hostess was welcome. A few days later we received a call from the organizer of the trip. “How many people are coming?” Brittney asked. Our eyes went big, after months of just the two of us and the occasional passing boat, 20 people felt like a full fledged invasion. We were gonna need to bake more bread. For the next few days we scrambled, polishing and sweeping out the pine needles and cedar boughs from the corners and wiping away the months of salt spray thrown against the lab windows by 40 knot storms. Walrus stepped off the boat and began to weave a path into the cedar as if he couldn’t stand another moment apart from his precious forest. There was no real plan, and people wondered hither and thither. It soon became clear what the first order of business had to be. Unbeknownst to me, Bob Hunter’s daughter held the last of her father’s cremated remains in her hands, wishing to lay part of him to rest in the quiet cove on the flooding tide. Brittney and I stood amongst the crowd huddled along the shoreline as the now flooding tide shuffled us slowly back. We listened to the eulogies to the man I had never met, but heard so much about. One of the original founders of Greenpeace, Bob Hunter had led a life that turned my eyes blurry and my cheeks wet with tears. He’d battled the nuclear testing in Amchitka, Alaska on Greenpeace’s maiden voyage, seal hunters, whalers, published books, and who knows how much more that would lay unwritten and untold. “It was Paul who convinced him to stick his head in Skana’s (a captive orca at the Vancouver aquarium back in the 1970s) mouth,” remembered one speaker. A small grin spread across my face, as in my mind I could see Paul goading him toward the edge of the tank, a mischievous grin on his face. As the ashes fell in the gentle breeze onto the waters surface, a First Nations man banged on a traditional drum, the bass echoing across the water and ricocheting off the silent old growth that stood sentinel over the proceedings. Goosebumps erupted across my body to hear the soundtrack of the land revive and return. An eagle soared over and a sea lion poked its head out at the mouth of the cove. As if they too recognized the sound, the song that spilled into Blackfish Sound, resonating in their hearts, a reminder of simpler times. The songs ended, Bob’s ashes scattered on the turquoise waters, piercing rays of sun cutting through the surface, a gentle breeze rustling the tips of the trees. They couldn’t have picked a better day to say goodbye and we felt incredibly honored to be allowed to bear witness to this intimate and precious moment. I do most of my thinking while I’m jogging. And most of that time I’m trying to decide what to write about next (or baseball, I think a lot about baseball). 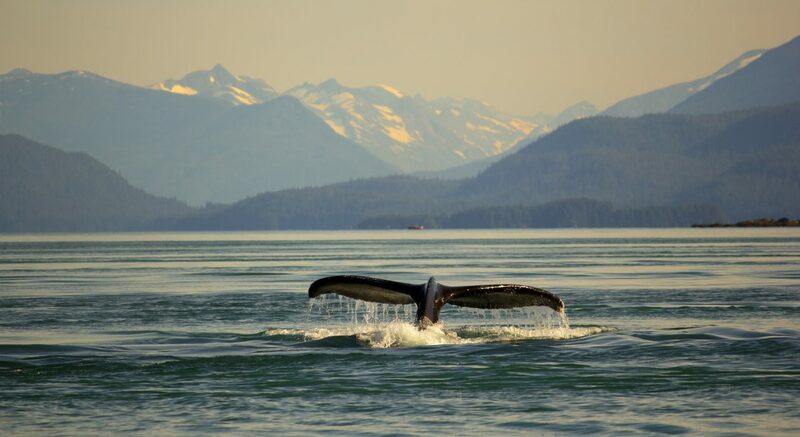 Since the day we started the blog, I’ve been mulling how to write my farewell to Juneau. I could write about my ten favorite memories, or the people that have impacted or changed my life the most, or whales, I almost decided to just default to whales. But how can you capture a place, it’s meaning, and it’s significance by simply rattling off a list of names, locations, and events? For me, that doesn’t do Juneau justice. Driving down Egan towards the bridge I stared south to the mountain range beyond the Taku River, trying to commit the image to memory and not swerve into oncoming traffic at the same time. But no matter how hard I tried to memorize the view, the shape of the peaks, their contrast with the field of greenery on Douglas Island, and the suns’ sparkling diamonds on Gastineau channel, the image fades. We look away and become distracted, the picture blurring and distorting. In a year you could show me a picture of that channel and the mountains beyond and I would probably recognize it. But heaven forbid I try to describe or recreate the picture in my mind. It is, tragically, how our memories are. The harder we try to hold on to pictures and moments, the quicker they seem to slip into some buried folder in the back of our minds. Instead, I will try to remember the way Juneau made me feel. The emotions it dug up, the feelings and passions it drove to the surface, and the influence it will have on me for the rest of my life. I came here because it was still Alaska, it had a university, and it wasn’t Fairbanks. It was my three step selection process and precious little thought went into it. I just knew I had to get out, try something new, and that I couldn’t handle another winter of darkness and 40 below. I arrived brimming with nerves, self doubt, and little confidence. I felt pressure to prove myself in class, find a research job, and be successful. It was turning me into a nervous wreck. I had to have life figured out and understood, and had to have it now. So Saturday morning I will stand on the stern deck of the ferry and watch Auke Bay pull out of sight. I’ll follow the road past Eagle Beach, Bird, Gull, and Benjamin Island, and slowly past Berner’s Bay. I’ll soak in as much as I possibly can and one last time, remember exactly how Juneau made me feel.